The return of the mixtape. As a child of the &apos;90s and teen of the &apos;00s, I missed the Gen X cutoff for romantic mixtapes. By the time I got to highschool, my classmates were making emo-heavy mixed CDs (think Bright Eyes and the Postal Service) to profess their undying love for each other. I remember being a tortured 13-year-old in 2002 and playing Damien Rice&apos;s O on a loop, back in the days of iPod classics that have now become obsolete. "Making a tape is like writing a letter — there&apos;s a lot of erasing and rethinking and starting again. A good compilation tape, like breaking up, is hard to do." The Elephant Mixtapes project is not only a celebration of the mixtape as an artistic statement, but a call to share that spirit with others as well. The founder of the movement, who wishes to remain anonymous, makes 10 copies of a mixtape each month and hides them in various locations throughout Chicago. If you discover one of the tapes, you can either leave it for someone else to find or choose to complete the following steps: look up the contact info inside the tape&apos;s artwork, take a picture of the tape with a description of where you found it and write a little note about what the music means to you. Then you have a few more choices: hide it again for someone else to find, make a copy for yourself or pass it along to a friend. Remember those scavenger hunt birthday parties that used to be so much fun when you were a kid? The Elephant Mixtapes project is a grownup version of that, with the added bonus of paying it forward through music. The movement has already picked up steam with articles in the Chicagoist and Gaper&apos;s Block, but so far, nobody has been lucky enough to find where these mysterious tapes are hidden. Eager to start sleuthing? Check the founder&apos;s website for updates and clues on the tapes&apos; whereabouts, as well as general information about how to share the project with your community and keep spreading the word. I don&apos;t own a casette player, and I don&apos;t know many people who do. Yet most of the twenty-somethings in my social circle (myself included) own turntables that we found in vintage shops and multiple stacks of vinyl collected from our parents&apos; basements. So why not resurrect the mixtape as the new novelty trend? Several local record stories (Reckless, Saki, Permanent Records, etc.) also sell an eclectic mix of audio casettes, and Amazon has a wealth of old-school cassette players in stock. 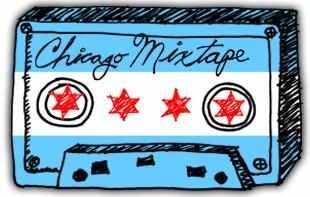 You can also sign up for the Chicago Mixtape mailing list to learn more about our city&apos;s vibrant local music scene, or go all Perks of Being a Wallflower on your crush and make them a mixtape of your own. Your thoughtful gesture may not have the same charming effect as the kid from Clash of the Titans had on Emma Watson, but at least you&apos;ll be spreading the love. Follow Leah on Twitter or add her on Facebook.